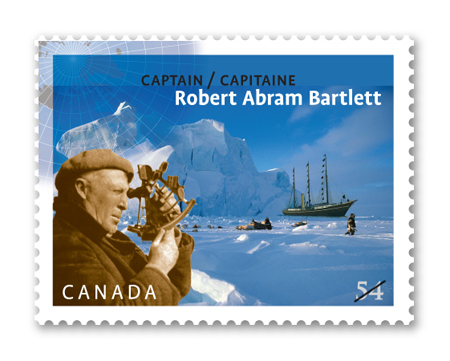 Continuing this year’s series of commemorative stamps is a new issue featuring Captain Robert Bartlett beginning on July 10th, 2009. Bartlett (1875-1946) came from a seafaring Newfoundland based family, and in his adult life developed a love for the Arctic. He was instrumental in mapping the area, and explored the far North right up to his death. He is credited as being the first man to sail north of 88o N. The Canadian Coast Guard vessel «Bartlett» is named after him.He was a hero also, rescuing stranded members from different expeditions, and received an award from the Royal Geographical Society as a result. He died in 1946 from pneumonia.